The primary goal of the aviation industry is to cater to the needs and demands of their clients and customers. The smooth functioning of any airline lies in the hands of not just the key stakeholders of the airline company in the organizational level but also on the major human factors in aviation such as the pilots, cabin crew, air traffic controllers, airline ground employees, baggage, and maintenance personnel. History of the major airline mishaps across the world reported that human error was the primary causal factor of majority of the airline accidents. The field of aviation psychology has been contributing to minimize and prevent these mishaps. Crew resource management which comes under the purview of aviation psychology aims at developing strategies for human error, accident prevention, and also to enhance the performance of aviation employees. Emotional labor: The process by which workers are expected to manage their feelings in accordance with organizationally defined rules and guidelines. Surface acting: It involves acting or expressing an emotion on the surface without actually feeling them. Deep acting: It involves modifying an emotion to match the organizationally demanded emotion. Cognitive flexibility:Aperson's awareness that in any given situation there are options available, and willingness and self-efficacy in being flexible and adapt to situations. Relational energy: Heightened level of psychological resourcefulness generated from interpersonal interactions that enhances one's capacity to do work. This review focuses on studying the interplay of emotional labor (EL), cognitive flexibility (CF), and relational energy (RE) among cabin crew. The researcher opines that the detrimental effect of EL can be moderated by RE among them, which in turn can enhance their CF. The researcher has reviewed extensively using online databases such as EBSCOhost, Springerlink, ProQuest, JSTOR, PubMed, and ERIC database. The relevant literatures are compiled chronologically and in accordance with common themes and related concepts. A research to investigate the social factors affecting EL was conducted by Talebpour et al. The study focused on 315 nurses working in a hospital. The result of the study revealed that the nurses had more deep acting than surface acting. Job autonomy showed to have more positive impact on EL as against job hierarchy which had a negative impact on EL. Another study by Von Scheve in 2012 tried to link the psychological model of emotional regulation with the sociological consequences of EL. This study was done to show that regulation of emotion is shaped by culture and society. A model was developed which showed that emotions are shaped by psychological and social factors such as culture and society. To predict burnout at work among healthcare workers, a study by Kovács et al. was conducted in 2010. The researcher also aimed to study the frequency of burnout among nurses and doctors. A cross-sectional study showed that nurses have higher emotional dissonance at work and lesser regulation opportunities than doctors. Nurses had fewer requirements to regulate empathy and sensitivity as against doctors. The strongest predictors of emotional dissonance were found to be emotional exhaustion and display of negative emotions for depersonalization. Mood, well-being, and general health are majorly impacted by stressors. EL also results in lower well-being and general health. The psychological, behavioral, and biological determinants of stress were studied by Schneiderman et al. They found that there is a relationship between psychosocial stressors and disease. This is proved to be affected by the nature, number, and stressor's persistence and also by the individual's biological susceptibility which comprises genetics and constitutional factors, psychosocial resources, and learned forms of coping. It is believed that jobs that involve dealing with people are emotionally taxing. Brotheridge and Grandey aimed to compare EL and burnout among occupations concerning people's work and otherwise. It was found that there was no significant difference in emotional exhaustion between the two types of occupations. However, jobs involving people work showed higher EL. Surface level predicted depersonalization and high burnout as against deep level which showed better personal accomplishment and positive benefits. In 2016, Shields et al. studied how acute stress impaired CF and how it differed in men and women. Healthy participants were randomly assigned to acute stress inductions or controlled conditions. CF was measured by administering Wisconsin's card sorting test. As hypothesized, stress showed to impair CF and men showed more impaired CF than women. CF, stress, and anxiety among starter and non-starter athletes were studied by Han et al. To test CF, Wisconsin card sorting test and trial making tests A an B were administered. STAI form Y, the Korean version, and visual analog scale were used to measure stress and anxiety. As hypothesized, the started group had better CF and lower stress and anxiety than the counterparts. The results also showed that better CF enhances performance of the athletes. A cognitive neuroscience investigation on cognitive inflexibility under acute psychosocial stress was conducted by Plessow et al. in 2011. The results showed that an increase in cortisol levels was inversely related to cognitive inflexibility. The study revealed that changes in cortisol levels were related to stress prompted CF. Since RE is a relatively new concept, its biological basis has not yet been explored so far. Social support has been seen to have a positive relationship with RE and they are relatively similar. The biological basis of social support was studied in depth by Whitaker-Azmitia. The social support circuit depends on neurochemical and cellular changes which help in responding to sudden changes. The primary chemicals involved in these responses were found to be oxytocin, serotonin, cortisol, and brain-driven neurotrophic factors. Social support is also a predictor of well-being of an individual and good health. In 2003, Snow et al. studied the relationship of work stressor, social support system, and coping with psychological symptoms among female secretarial employees. A structural equal model using cross-sectional and longitudinal method was used. The risk factors were avoidance coping and work stressors. The protective factors were social support and active coping. A study to investigate social support, job stress, health, and job satisfaction among nurses was conducted by Bradley and Catwrigt. The results showed that perceived social support was directly related to nurses' health and level of job satisfaction. In 2015, Mitchell conducted a correlation study on EL and employee engagement in pediatric setting. Bivariate correlation and curvilinear regression revealed that hiding and faking feelings were negatively correlated with employee engagement. The five subscales out of six of EL scale, namely, intensity, frequency, variety, deep acting, and hiding feelings, showed significant curvilinear relationship with employee engagement. There was no moderating effect of gender in the study. The relationship between the strategies of EL and job performance and turnover of the employees was investigated by Goodwin et al. Call center employees were the participants in this survey. The results revealed that only surface acting was directly related to employee turnover and emotional exhaustion. Some of the organizational factors impacting motivation to use EL and emotional regulation strategies among call center employees were studied by Cossette and Hess. The results indicated that organizational justice on EL strategies was mediated by motivation, but it did not mediate the influence on job anatomy. Owens et al. showed positive implication of RE at work with job performance and job engagement. They identified implication of RE at work with job engagement and job performance. They also conducted four studies to develop and validate the construct of RE. Their study found that RE predicts job engagement and is positively related to performance at work. In 2015, Suryavanshi studied the effects of CF and contextual interference on retention and performance in a simulated environment. Two kinds of interference were provided, namely, block and random contextual interference. CF showed to predict learning and retention performance. In 2012, Malooly conducted a research to study the relationship between CF and online reappraisal. They also focused how affective flexibility is related to cognitive appraisal. CF was not related to affective flexibility. Emotional regulation was seen to be predicted by one of the components of affective flexibility especially when the situation was negative. A study by Joormann and D'Avanzato in 2010 has also shown that individuals with depression have poor CF and poor control of negative events thereby leading to emotional regulation deficits. A critical review of the aforementioned literature brings to the conclusion that the major variables in this study, namely, EL, RE, and CF, have similar implications and influences. The biopsychosocial implications and organizational outcomes lead us to the assumption that a comprehensive approach can prove to be beneficial. No published research so far has tried to investigate the variables from an integrative perspective. From the review of the available literature, we see that RE proves to be a positive element at work. Therefore, cabin crew members who are usually the givers and seldom the receivers can benefit from a biopsychosocial viewpoint. Although much importance has been given to social support and perceived social support in various settings, not much emphasis has been given to the energy derived from such interactions. EL, a burning issue among aviation employees, has been widely studied across various settings. But the researcher in this study aims to develop a comprehensive model which will aid to find a solution to EL among the cabin crew members. In addition, in the above review it is seen that the majority of the literature have been done in various settings such as aviation, healthcare, hospitality, and academics; and the findings are relatively consistent. Thus, in this study the researcher argues that the three constructs are related, and hence proposes a hypothetical model to investigate the same in the aviation setting. Talebpour A, Khurasghani AR, Ghasemi V. Investigating social factors associated with emotional labor among nurses (case study; Tehran West Region Hospital's). Mediterr J Soc Sci 2013;4:369. Von Scheve C. Emotion regulation and emotion work: Two sides of the same coin? Frontiers in Emot Sci 2012;3:496. Kovács M, Kovács E, Hegedűs K. Emotion work and burnout: Cross-sectional study of nurses and physicians in Hungary. Croatian Med J 2010;51:432-42. Schneiderman N, Ironson G, Siegel SD. Stress and health: Psychological, behavioral, and biological determinants. Ann Rev Clin Psychol 2005;1:607-28. Brotheridge CM, Grandey AA. Emotional labor and burnout: Comparing two perspectives of people work. J Vocat Behav 2002;60:17-39. Shields GS, Trainor BC, Lam JCW, Yonelinas AP. Acute stress impairs cognitive flexibility in men, not women. Stress 2016;19:542-6. Han DH, Park HW, Kee BS, Na C, Na D-HE, Zaichkowsky L. Performance enhancement with low stress and anxiety modulated by cognitive flexibility. Psychiatry Investig 2011;8:221-6. Plessow F, Fischer R, Kirschbaum C, Goschke T. Inflexibly focused under stress: Acute psychosocial stress increases shielding of action goals at the expense of reduced cognitive flexibility with increasing time lag to the stressor. J Cognit Neurosci 2011;23:3218-27. Owens BP, Baker WE, Sumpter DM, Cameron KS. 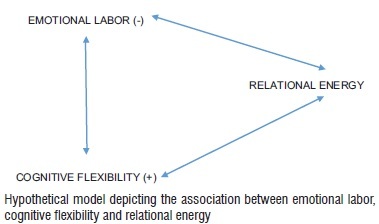 Relational energy at work: Implications for job engagement and job performance. J Appl Psychol 2016;101:35-49. Whitaker-Azmitia PM. Serotonin and brain development: Role in human developmental diseases. Brain Res Bull 2001;56:479-85. Snow DL, Swan SC, Raghavan C, Connell CM, Klein I. The relationship of work stressors, coping and social support to psychological symptoms among female secretarial employees. Work & Stress. 2003;17:241-63. doi: 10.1080/02678370310001625630. Bradley JR, Cartwright S. Social support, job stress, health, and job satisfaction among nurses in the United Kingdom. Int J Stress Manage 2002;9:163-82. Mitchell ML. Emotional labor and employee engagement within a pediatric hospital (Doctoral dissertation, Walden University); 2015. Goodwin RE, Groth M, Frenkel SJ. Relationships between emotional labor, job performance, and turnover J Vocat Behav 2011;79:538-48. Cossette M, Hess U. How organizational factors impact emotional labour strategies. A paper presented at the Conference of the Administrative Sciences Association of Canada, Niagara Falls, 2009. Suryavanshi R. Exploring the effects of cognitive flexibility and contextual interference on performance and retention in a simulated environment (Doctoral dissertation, Florida State University); 2015. Malooly AM. The role of affective flexibility and cognitive flexibility in effective antecedent-focused and online reappraisal; 2012. University of Miami. Joormann J, D'Avanzato C. Emotion regulation in depression: Examining the role of cognitive processes: Cognition & Emotion Lecture at the 2009 ISRE Meeting. Cognit Emot 2010;24:913-39.